Lancaster City boss Phil Brown. Boss Phil Brown hopes Lancaster City’s run to the semi-finals of the Lancashire FA Challenge Trophy can bring some excitement to Giant Axe. The Dolly Blues saw off Ashton Athletic 2-0 on Tuesday night to join Colne, Padiham and holders Chorley in the last four. Ahead of his side’s return to Evo-Stik First Division North action at Spennymoor Town on Saturday Brown believes the often-maligned county cup can help bring some good times to the city. He said: “I think it’s a bit of myth that the competition doesn’t mean anything. “Certainly over the last few years, maybe since the final has moved to Bolton, with the crowds that go to the semi-finals and finals and the reactions of the players you can see what it means. “It’s a great chance for teams to build momentum and pick up some silverware. “Everyone is putting strong teams out. The win over Ashton was hard-fought as goals from Danny Carlton and Ryan Winder saw the Dolly Blues return to action after four straight postponements with a win. Brown said: “It was a competitive game in difficult conditions. “We knew we couldn’t play out normal football but we did the ugly side well. “It’s something we’ve got to get used to doing, especially at this time of the season. “But we scored two really goals and kept a clean sheet. Next up for City is a tough trip to the North East to face Spennymoor, a play-off chasing side who have often got the better of the Brown’s Blues over the last few years. Brown said: “It’s a long time since I’ve been there. It was when I was player to be honest. “They’ve been really strong since they came into the Evo-Stik though. “They’re just outside the play-offs but have got a few games in hand. “A couple of our players have played against them for other sides this season and say they are a decent outfit. 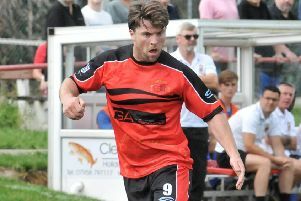 Craig Carney was ineligible for the win over Ashton Athletic but looks set to make his second City debut at Spennymoor. With Brown also hoping to confirm the signing of a striker before Saturday the Blues boss has plenty to ponder. He said: “Craig being unavailable gave others a chance. “Both Jake Gregory and George West, on his first start, did well. “I’ve got some difficult decisions to make when I finalise the squad on Friday.